The media is often accused of fear mongering and it seems it was no different 100 years ago. The onset of WW1 saw reporting that heightened fear with people leaping at shadows believing the Germans were invading Australia. When I first came across the following article, I thought it was an isolated case. 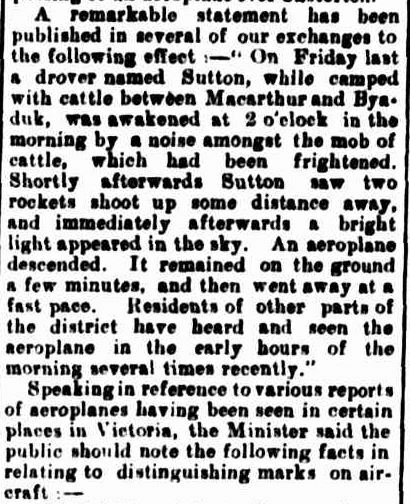 A Victorian drover, Mr Sutton spotted a plane in the night sky after the noise of his agitated cattle woke him while camped somewhere between Byaduk and Macarthur. While half asleep, he saw two rockets fired. According to the article, from the Hamilton Spectator his was not the only sighting in the district. 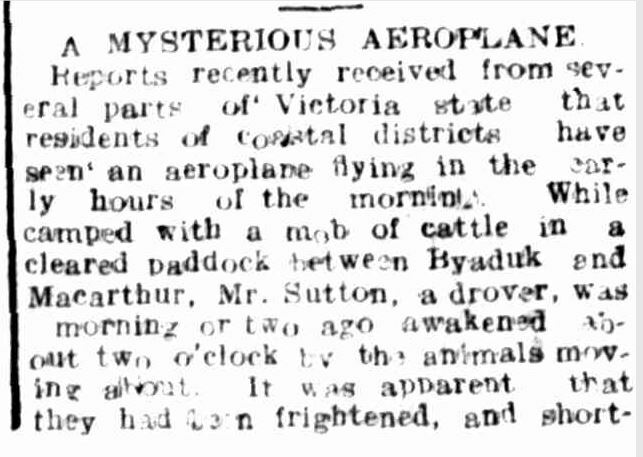 “A MYSTERIOUS AEROPLANE.” Hamilton Spectator (Vic. : 1914 – 1918) 20 Apr 1918: <http://nla.gov.au/nla.news-article119501085&gt;. The copy of the article was not good so I thought I would see if any other papers reported on the sighting. Did they what. 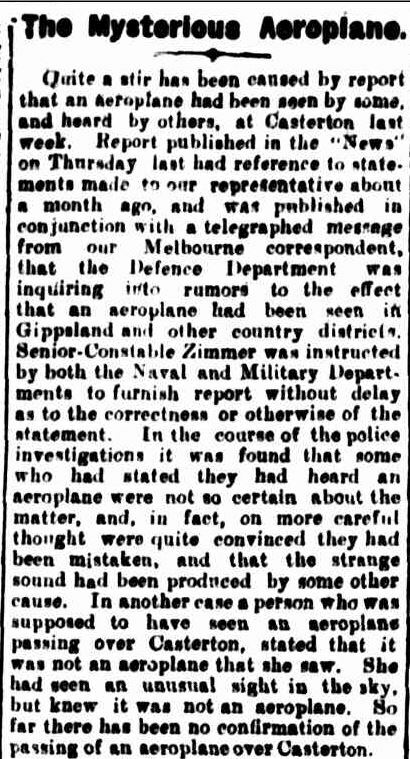 A search of “Mysterious Aeroplane” at Trove brought up dozens of reports of various people across Victoria claiming to have seen or heard planes. The Defence Department investigated, however some witnesses were doubting what they previously thought they heard or saw. 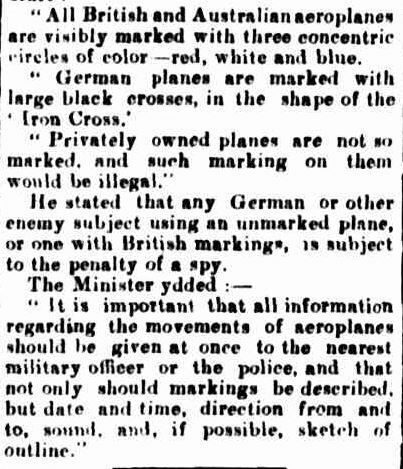 The Minster for Defence clarified the markings of the planes of the allies and the enemy which surely wouldn’t have allayed the fear of the public. 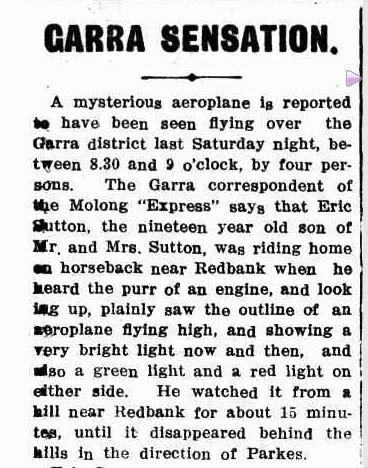 “The Mysterious Aeroplane.” The Casterton News and the Merino and Sandford Record (Vic. : 1914 – 1918) 25 Apr 1918: 3 Edition: Bi-Weekly. <http://nla.gov.au/nla.news-article74220662&gt;. Mysterious aeroplanes aside, what was really mysterious for me was the surname of witnesses from the 1915 and 1918 sightings. The drover who saw the rockets in 1918 was Mr Sutton. Three years earlier, Eric Sutton of Redbank, NSW saw the lights of a plane. I did check. There were Suttons living at Macarthur in 1914 and Mr Sutton the drover was possibly Issac Sutton from that town so it’s unlikely there was any connection. Just a strange coincidence. 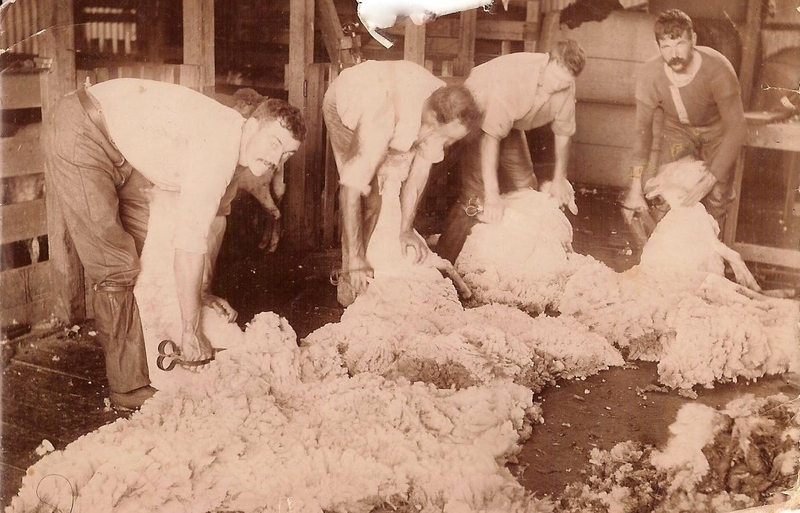 “GARRA SENSATION.” Western Champion (Parkes, NSW : 1898 – 1934) 9 Dec 1915: 28. . This entry was posted in Trove Tuesday and tagged Macarthur, Sutton. Bookmark the permalink.